- The fix star ALGOL is in conj. 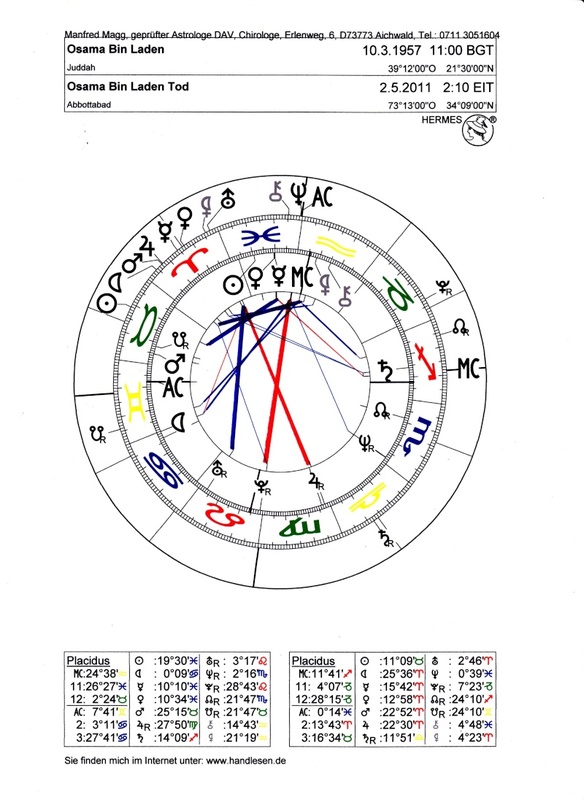 with his Mars, within an Orbis of 1°, and with Ketu in house 12. >> Here I would be very interested in the interpretation of our palmists from Pakistan and India, because the old Western tradition for this constellation is unambiguous. - The fix (King's) star REGULUS stands in conj. with the redrograd Pluto down in house 4, within an Orbis of 1°, too. Nice to see that you have posted the 'right' version of Osama Bin Laden's - after I describe that the internet if full which mirrored-variants of the same photo. PS. Following your request to move this topic away from the 'remarkable & honourable' section, I decided to move this topic to the section 'the hands of politicians' (since I think it is more fair to associate Bin Laden's "life-work" with politics, than with religion). 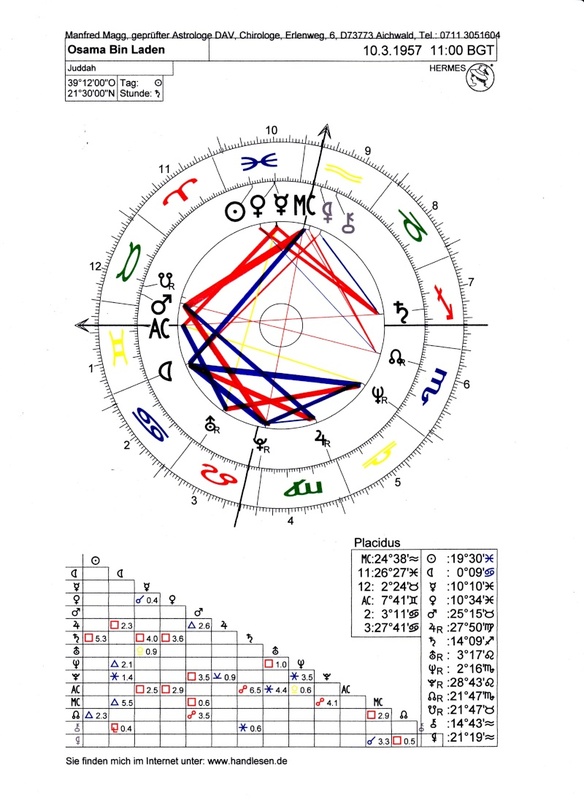 What would you call the 'fighting/killing" transits? Would the change in the cusps change where Pluto enters the 8th House? Saturn transiting 5th house would have some restrictive influences on fun, games and children. His fortress was his own prison. Sun in 12th may have pulled him more inward, or deeper in thoughts of delusions, illusions or plans and not alert to his outer invironment. Neptune in the 10th house may have added to that effect and Chiron would have made it personal. Martijin is right, His profile should be on Politician list. In internet some that types of pictures are present, I would like to share it with my community. sorry to mention here this. He has the thumb of spiritualist. could not see minute fine lines from the hand. however, his major lines are perfect and common like a ordinary. Hope, we all know the osama was greatly intimate with american goverment at his early age. His target is to destroy the reputation of america , then demonstrate their illegal activities of dominating other countries, and also to demonstrate how america involving in other countries political matters rather than destroying humanity as a whole. However his violent nature is demonstrated in bulged (upper) mars. In some classical palmistry, there is no two mars mount. what i can say is that he had reason for his violent activities like how america reasoning their war activities on other countries. 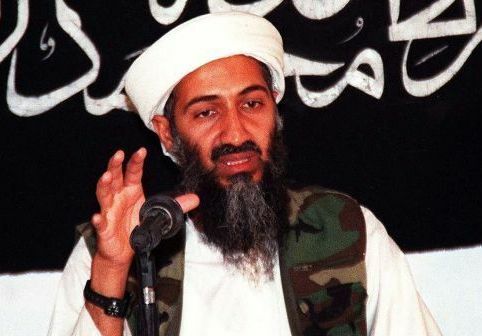 Infact osama was a born billionare. He had abundant wealth to give debts to many countries as well. Hence, he is not selfish. He just wanted to demonstrate to the world how america is occupying and getting the wealth of arab countries. ie.,barrels of crude oils and tons of gold bars from iraq. 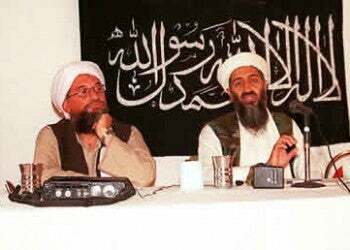 I highly appreciate expert's reading on osama's hand as well. it's very easy to destroy and very hard to build up great work. I always prefer and appreciate very much people who are of the second type. I see time 11:00 and vote this as a sign that the time could be not very accurate, therefore I would count the exact house borders not too much. When I have a little bit more time during the next days, I'll make new graphics about the birth and fighting time. The last is what I called the fighting/killing situation. - If the fight started with 1:30 am and it lasted 40 Minutes, the exact time of death should be around 2:10 am Abbottabad / PK. asif amin wrote: Martijin is right, His profile should be on Politician list. From my understanding no photos of Bin Laden's body have been released. This is obviously photoshopped. The consequences of his actions was evil and violence. I think two things drove him, hate for Westerns (and he was 'used' to fight the Russians) so this would be political passion, and his love for his faith and his culture. Energized and fueled by the continuous flow of followers willing to blow themselves up for the cause. An evil devil to some, and to others a hero. Powerful leaders like him and Hitler have something that draws out extreme polarities. Shouldn't pure evil be hated by all? Those that admire these people see them as some kind of 'rescuer or saviour' or a revolutionary. I think the moment of Osama's demise is reflected on the little image in her pupils. 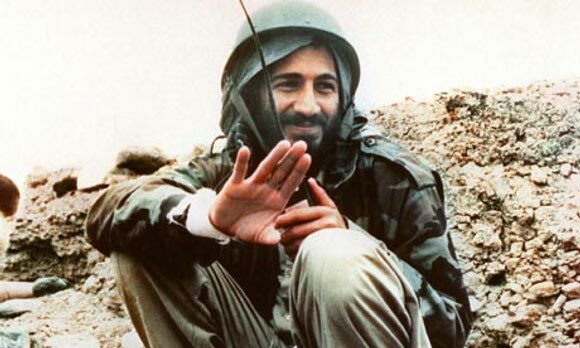 The person who shot Bin Ladin was wearing a camera, rumor has it, they watched a live feed. 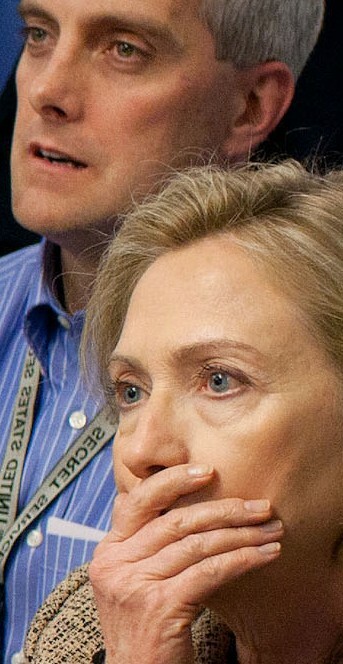 In the full photo, Hillary's fingernails are bluish near the base on both hands. I believe she was literally holding her breathe. bar. In contrast, osama killed nearly 3000 peoples in sep11 event. Now tell me who done the top most evil devils and who is being top most evil devil man! Thank you Manfred! I'll look forward to the new graphics! I've exchanged the charts, please, look up. I think that the possible difference to the exact birth time is very small. The beginning of the fight was 1:30 am, I took 2:10 am, the end of the operation. May be this is a little bit too late, but here we have Neptun in conj. with the AC. 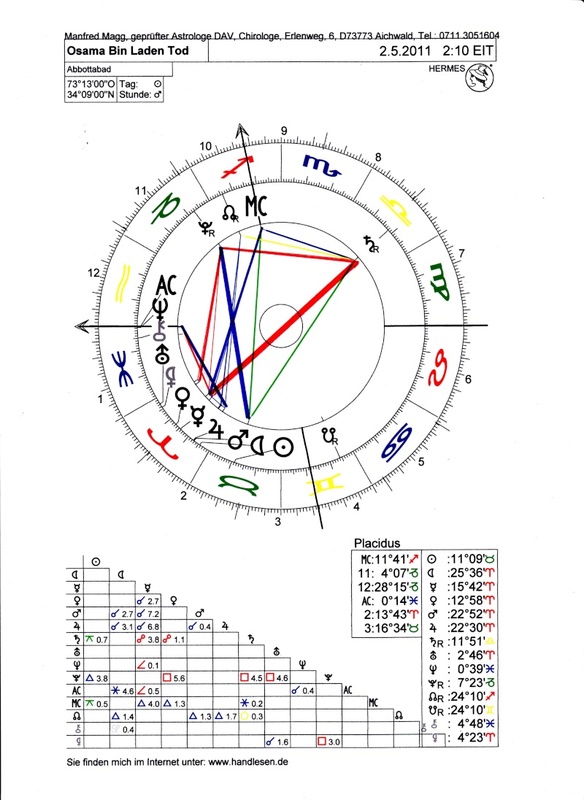 I also made the Solar return chart, if you are interested - The Sun is there in house 8. Some notes about the charts later. you appears to be pacifist. As per your views, there is no requirement of military force in any countries. It is impossible to fall down iron made 110 story (floor) twin tower with Boeing airplane collisions. It is all High level drama of the USA in order to attack in Asian countries those have rich in oil, gas and minerals. In Arabian countries, major African Countries and Asian Countries consider it a great fabricated plan of the USA. Thanks for the information asif. Interesting! wondering how my mobile phone supported this video. may i know the website. stalin.v wrote: Thanks for the information asif. Interesting! As you know, this forum is meant for discussions that relate to hands. I have considered to delete the 'fictionary' photoshoped-picture of Bin Laden's face + the 'fictionary' conspiracy-video from this topic, but I can tolerate both elements... under the condition that no other 'conspiracy theories' are added to this topic. People, let's talk about hands... adding more 'conspiracy theories' does not add anything to the purpose of this forum, and therefore new posts that navigate too far away from the title of this topic will be deleted from this topic. Yes, I know that is not related to forum rules, apologies for that posts. You may delete that posts. Thanks for the new charts. “I had acquired information from a Muslim historian, (on the Internet) who said bin Laden was born 3rd month, 10th day of the Muslim calendar year 1377"
Would that translate to March 10, 1957 in our calendar? <edit> It is interesting that they also show the birth date as July 30th. He seems more like a Leo than a Pisces. I see many peoples in this forum seems to be prejuidiced views on osama , which spoils the real palmistry perspective views we should undertake. No one so far has mentioned/proved the points supporting for the massacre/killing peoples from his hand. He has neither blood line nor murderer's thumb. 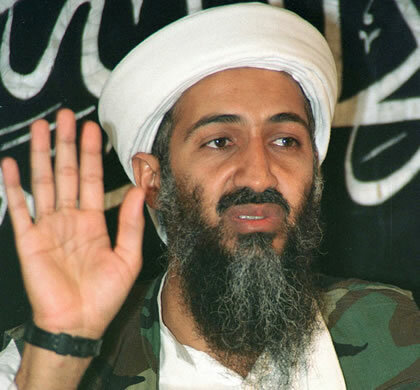 I wonder on what palmistry grounds they claim that osama is a evil man. Infact, his fingers are not crooked nor he has simian line. Wondering how palmistry experts are going to pinpoint the features to support the claim, so called 'devil person'. I believed so far that western palmists are highly good in character reading. how it is to be done in this case? I also noticed the discussion between patti and manfred. In that, it is to be said that neptune stays in his 10house. it again prove that his main works were all around the religion and spiritualism. 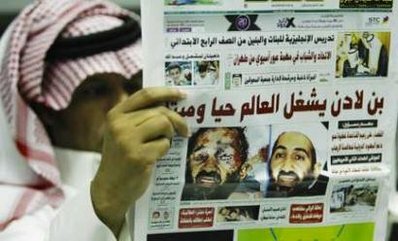 but, i see that few of the discussers in this topic revolve on prejuidistic views as they have heard through "news" that osama is a bad man. This reason suggest that we made no scientific discussion in this topic . Rather Approaching him only with prejuidiced mind. If the birth information is correct, transiting Neptune is now in his 10th house. Natally Neptune is on the cusp of the 5th and 6th house. Mixing work with young people & play, and work with idealistic pursuits, as I would interpret it. Neptune transiting the 10th could bring this to focus as his current public expression and with his death, his legacy. can you please present those content in english in this particular page? 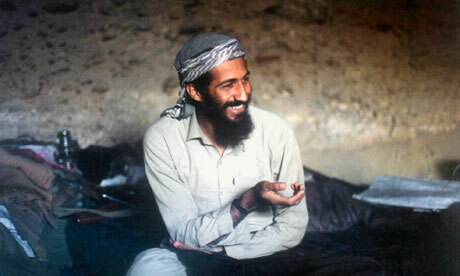 it would be great to read your perspectives on osama's hand. I'm not shure, If it'll be possible because I'm still very busy at this time. - In the meantime, please use the google language tools for translation.